eMotion Ag is senseFly’s easy-to-use flight and data management software for the eBee SQ. 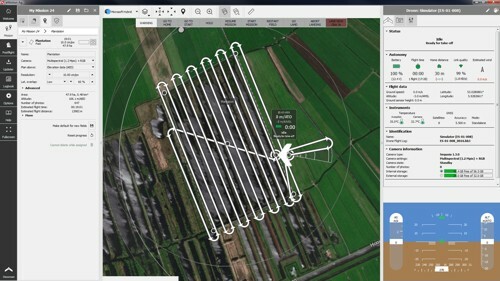 It supports field boundary imports, multi-field flights, and the direct uploading of the drone’s multispectral images to cloud services to create machine-readable application maps. With its simple, field-based flight planning, multi-flight projects and built-in Flight Data Manager, eMotion Ag helps you get your drone quickly in the air and minimise the time you spend planning flights and managing data. eMotion Ag is fully compatible with your existing Farm Management Information System (FMIS), ag machinery and workflow. There is no need to reinvent how you work. eMotion Ag is the connected hub of your drone operations. It connects wirelessly to your drone, to popular online cloud solutions, and even includes airspace data and weather updates. Draw a simple shape around the field (or fields) you want to fly. Then, define your required ground resolution and suggested possible landing zones. eMotion Ag automatically generates your drone’s flight plan, calculating the eBee SQ’s required altitude and displaying its projected trajectory. Large-scale multi-flight missions are also supported.